Now, google “7 billion” or “all people” and you’ll see some pretty things, like Fathom’s Dencity and bmander’s North American DotMap, bobbing in an emotionless sea of Excel charts, peppered by strange tidbit upon offbeat factoid, ad infinitum. For example, did you know that every human being on the Earth, packed tightly, would fit inside a 900-meter-diameter sphere? Me neither. However, had you wanted to experience the world’s population in its most primitive form – a single Web page featuring seven-billion-plus faces, dots, or whatever – as of yesterday, your search would’ve turned up bupkis. A hole in the Internets! Which, upon discovery, as a capable netizen, I was obligated to fill. Editor’s Note: I’ve since learned that the “7 Billion World” website has existed since October 2011. Check it out! 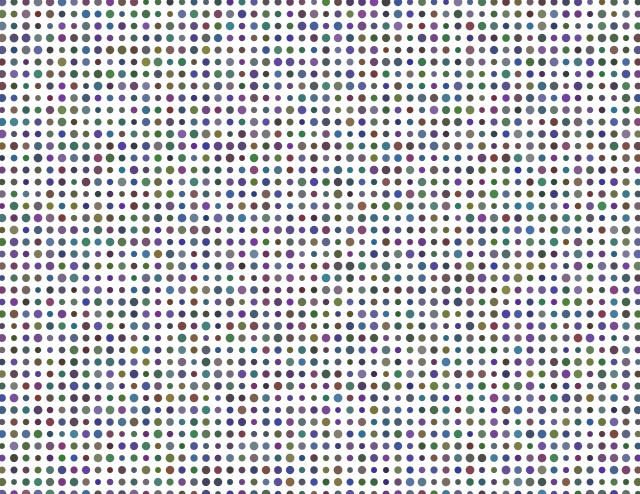 That’s a dot for every man, woman, and child alive today, dynamically indexed to the nearest million per U.S. Census Bureau estimates. Arranged similarly, in real life, these seven gigapeople would cover the entire state of Rhode Island. Within is lots of latent mischief, more than a few megatons of evil, and simultaneously, an even greater potential for creativity, kindness, and love. Enjoy, and let’s be good to each other out there.